Century Wind Farm in Iowa. The wind industry is the second-largest recipient of government subsidies in the renewables sector. NEW YORK (CNNMoney) -- The federal government spent $24 billion on energy subsidies in 2011, with the vast majority going to renewable energy sources, according to a government report. Renewable energy and energy efficiency accounted for $16 billion of the federal support, according to the Congressional Budget Office, while the fossil-fuel industry received $2.5 billion in tax breaks. This is a stark change from a decade ago. The CBO noted that until 2008, most energy subsidies went to the fossil-fuel industry. The idea at the time was to encourage more domestic oil production, especially when the price of oil was low. CBO said the $24 billion total is a small fraction of the hundreds of billions the government's various annual subsidies, which take the form of both grants and tax breaks. The report, released Tuesday, comes amid intense debate over energy policy in Washington. The Obama administration has repeatedly called for the elimination of tax breaks for oil companies, saying the near-record profits reaped by the industry no longer justify such tax breaks. Meanwhile, Republicans continue to be unhappy with how the Energy Department has handled some of the programs it administers, notably the loan guarantee program that funded the now-bankrupt solar-panel maker Solyndra. Some lawmakers want federal support for renewable energy scaled back or eliminated altogether, arguing the technology is not cost competitive and the subsidies are a waste of money. Renewable-energy advocates argue they should be the beneficiaries of the federal support, as it will put them on an equal footing with oil and gas competitors that received so much in past subsidies. They say that while renewable technologies may be more expensive now, federal support provides a crucial market and that, given time and economies of scale, renewable technologies will eventually be able to compete with fossil fuel. Players in the renewable-energy sector include everyone from small manufacturers of solar panels to multi-national oil companies and investment banks. 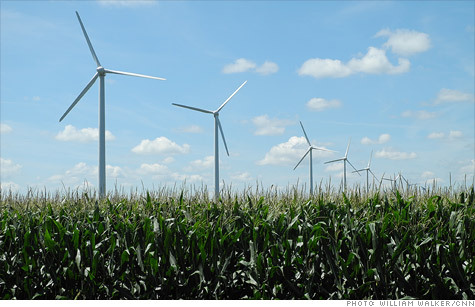 The CBO report said tax credits for the ethanol industry totaled over $6 billion, making it the largest single renewable-energy recipient. Ethanol tax credits usually go to refiners, which include some of the largest companies in the world like Exxon Mobil (XOM, Fortune 500), Royal Dutch Shell (RDSA) and BP (BP). The wind industry is the second-largest recipient of government tax breaks in the renewable sector. CBO was mostly critical of government tax breaks as a means of spurring investment in energy production. "They are generally an inefficient way to reduce environmental and other external costs of energy," the report said. "They often reward businesses for investments and actions they intended to take anyway." The report said some type of tax on dirtier fuels like oil or coal would be a better way to discourage certain energy sources and promote others. Most economists agree, but it's a difficult sell politically. Few politicians have advocated increasing the gasoline tax, especially in an election year and with gas prices already near record highs. The report said government support for basic energy R&D is a better investment, as businesses are reluctant to make bets on long-shot technologies but the pay-off for society when one pans out can be significant.